One of yoga's most common breathing tools, Ocean Breathing (also known as Ujjayi or Victorious Breath) combines deep breathing with the sound of the ocean to create calm, focus, clarity and overall well-being. 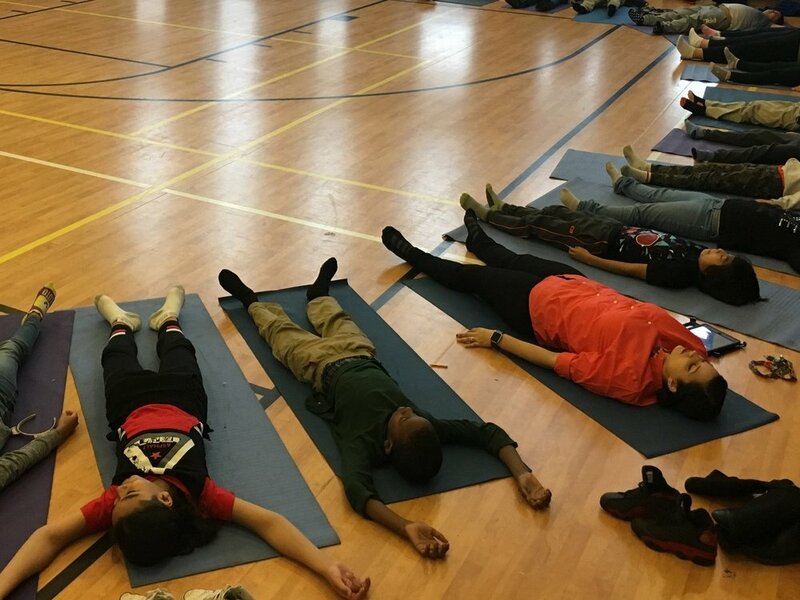 We can use Ocean Breathing to energize while we practice yoga poses and also to calm and focus the mind before relaxation. You can play the ambient sounds video above or ring a chime or singing bowl gently throughout this visualization to create relaxed focus. Close your eyes and allow your body to sink into the floor. Be very still and very quiet. Connect to your breath – gently inhaling and exhaling. Let your body completely relax. We learn ocean breathing by breathing in and out through of our mouths. As you breathe in, feel the air moving over the back of your throat. As you breathe out, whisper "ahhh" as if you were fogging up a mirror or a pair of glasses. Notice the slight constriction at the back of your throat that creates that sound. Continue to breathe with your mouth open until you can also notice the slight constriction occurring on the inhale as well. When you feel comfortable, close your lips and breathe in and out through your nose while maintaining the slight constriction at the back of the throat. See if you can make your breathing long and smooth, matching the length of your inhale and your exhale. Allow the sound of the "ocean" to soothe and focus your mind. As you breathe in deeply, feel your belly and ribcage expand and imagine a wave rushing in and filling you up. As you breathe out, feel your belly fall and ribs relax together and imagine the wave receding from the shore. Continue this breathing and visualization for as long as you like (3-5 minutes) and then allow your breathing to return to normal. Imagine the waves have washed you to shore and you lie safe on a beach of warm, soft, white sand. Allow your whole body to sink into the sand below you. You feel a soft breeze on your face. You feel the warm sun on your body. What do you smell? The smell of salt air, the fresh breeze, or the cool crisp water? What sounds do you hear around you? Continue to notice anything that is present around you, in your breath and in your body. Relax as long as you like and then slowly wiggle fingers and wiggle toes. Hug your knees to your chest and curl up like a little ball. Give yourself a big hug, roll to one side and slowly sit up. Give children the opportunity to draw or share how they feel after the relaxation. Or you can pass around a breathing ball or talking stick and have everyone take a turn to share how they are feeling. Remember: The more you practice, the easier it will be for both you and the children to settle into calm. You will notice children quieting more quickly and staying for longer periods of time.